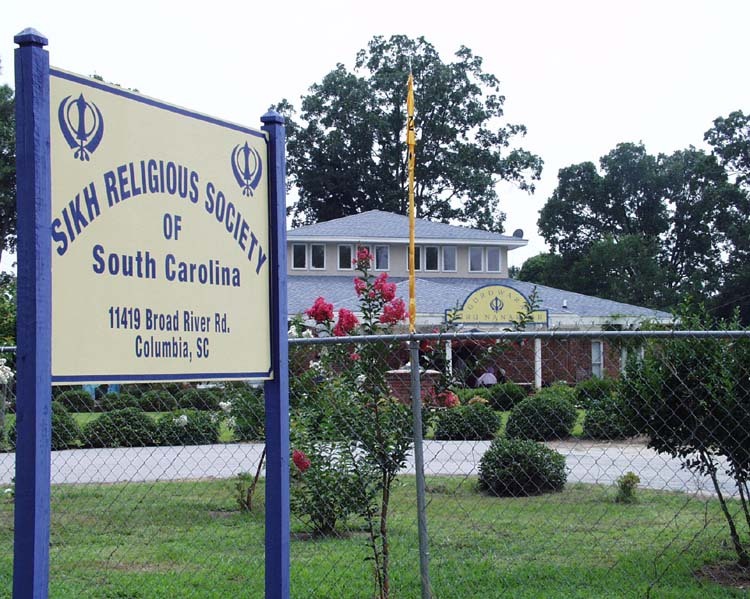 Members of the Sikh Religious Society of South Carolina meet every Sunday except the second Sunday of the month at 12:00 p.m. at the gurdwara in Columbia. On the first and fourth Sundays, attendance is mainly composed of families residing in Columbia or the Midlands area of the state, and the shabad (hymns) are led mainly by the children (teenagers) in the congregation. The third Sunday is the largest gathering of the month, when Sikh families travel from all over the state to Columbia for the service. On these Sundays, the service is slightly longer and the music is led by adult musicians. After the service, the traditional langar, the vegetarian community meal, is served to everyone. The children play a large role in preparing for the meal in helping to set up the mats on the floor and handing out disposable dishware and napkins. In addition to the religious services, the gurdwara also sponsors a “Sunday school”-type educational course for the children on the third Sunday of the month. Children learn the basics of the faith and the Punjabi language. The first Sikhs came to the United States around 1895, at the time of the Gold Rush in the West. They settled in the San Joaquin Valley in California, according to Dr. Malkiat Guram, contact person for the gurdwara. In 1955, more Sikhs began moving to the United States and establishing themselves in farming (a Sikh man in Fresno, C.A. is the largest peach grower in the U.S.) and in the professional world. There are two counties in the San Joaquin Valley area that now have a majority Sikh population and are referred to as “mini-Punjab,” according to Guram. In 1964, Guram came to Ohio State to get his Ph.D. in biology. During this period, India was converting its educational system from the British to the American and several of the “Big Ten” universities in the U.S. adopted an Indian state to help with the process. This arrangement, along with the changes in immigration law in 1966-67, made it possible for Guram’s family to join him in the United States in 1967, after he finished his Ph.D. He moved to South Carolina that year when he was appointed chair of natural sciences at Voorhees College in Denmark, S.C. (about 50 miles south of Columbia). Later, he was appointed a dean of the college and continued to work there, even though the family relocated to Columbia in 1972. Guram said he believes his was the first Sikh family in South Carolina. After he and his family settled, many of their relatives came to S.C. and other Sikhs in the U.S. and in Canada began to move south because the southern climate is similar to that of Punjab (hot and humid, minus the Punjabi monsoons). Guram also said many Sikh physicians started moving south in the late 1970s because of the greater number of job opportunities. The first gurdwara in the South was built in Raleigh-Duram, N.C. in the 1980s, and there are other gurdwaras located in Augusta and Atlanta, G.A. The Columbia gurdwara was not completed until around 1994, and it took the community four or five years before that to raise money for the project. Guram reported no problems in acquiring the three acres of land for the gurdwara, located near Interstate 26 on the northern side of Columbia (near Ballentine, S.C.). The opening of the gurdwara in 1994 was marked with a dedication ceremony in which the Sikh flag was raised and saluted in front of the gurdwara, followed by a dedicatory prayer. A similar service was conducted inside the gurdwara (with the exception of the flag-raising). As of the summer of 2003, the Sikh Religious Society of South Carolina is planning to expand its current structure to accommodate the growing number of Sikh families in the state. The new structure will be the new worship hall and will be separate from the original building. The old structure will be used mainly as a kitchen, allowing for the expansion of the current kitchen into the space of the original sanctuary. Members of the Sikh Religious Society of South Carolina are almost exclusively immigrants or children of immigrants from the state of Punjab in India. The predominant languages spoken are Punjabi and English. All age groups are represented at the gurdwara and there are many children who attend the Sunday school. 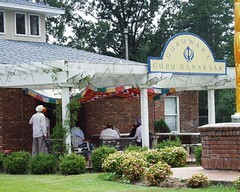 The gurdwara is a small square brick building with a covered patio area with chairs and tables in front where congregants (it seems mostly the male congregants) gather before the services for informal socializing. 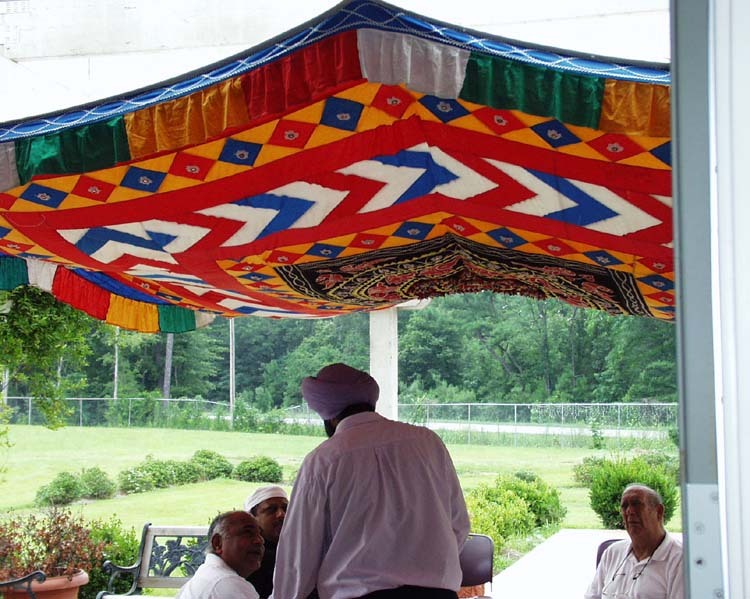 The gurdwara also serves an assortment of Indian foods (“snacks,” as the members referred to them) outside on the patio prior to the services. The roof of the patio is decorated with a multi-colored cloth that hangs from the “ceiling” of the patio and Christmas lights that run along the perimeter of the patio roof. 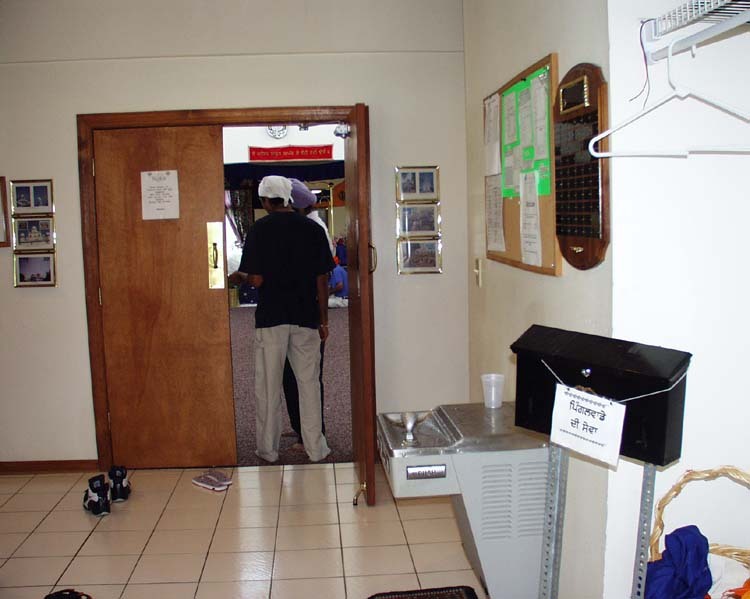 Upon entering the gurdwara, one enters a small foyer area with floor-to-ceiling shelves on the right and a shorter stack of shelves on the left for storing shoes. There are also two bulletin boards, one on each wall, and a water fountain on the right wall. Directly in front is the door into the worship hall, and to the left and right of these doors are two hallways leading to various smaller rooms, used primarily as classrooms. The worship hall is accessible from the foyer by a pair of swinging wooden doors. During worship services, an Oriental runner rug is stretched from the door to the foot of the altar, where the Guru Granth Sahib rests under a canopy. Devotees enter the worship hall, walk down the rug to the altar, prostrate themselves in front of the Guru Granth Sahib, and place an offering into a bowl at the foot of the altar before taking a seat on the left side of the rug, if they are male, or the right side if they are female. The floor where the congregation sits is covered by white sheets during services. 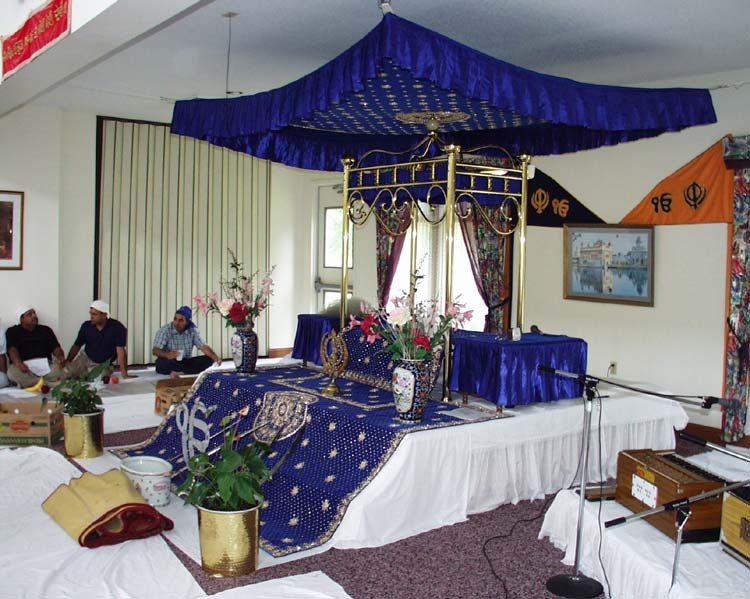 The altar is decorated with deep blue fabrics with gold trim, and the area where the Guru Granth Sahib is placed resembles a mini-bed, with a gold metal canopy above it, which is also decorated in the same deep blue fabric. A member of the congregation sits behind the altar and sweeps the air above the Guru Granth Sahib with a chauri, a horsehair brush associated with authority in Indian tradition. The scriptures are kept covered with a cloth unless someone is reading from them, at which time the cloth is removed. After the reading is finished, the book is covered with a new cloth. This changing of covers is like when a prophet changes clothes to stay clean. The Adi Granth (another name for the Sikh scriptures) is regarded as the current guru, or teacher, of the faithful and thus is treated as a living person would be treated, from the changing of its “clothes” to its storage in a full-sized bed in another room of the gurdwara while not present inside the prayer hall. 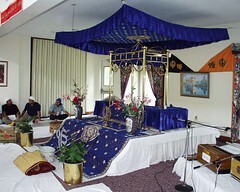 To the right of the altar is a small raised stage area where musicians sit to lead the kirtan (praise songs). The area is stocked with two baja (harmonium; an instrument with a keyboard like a piano that is played by pumping air through the instrument while pressing the keys, similar to an accordian) and a set of jorri (tabla; drums) and is well-amplified by several microphones trained on the instruments as well as the singer’s mouths. The left wall of the worship hall is a shutter-like divider that can be retracted, revealing the kitchen. 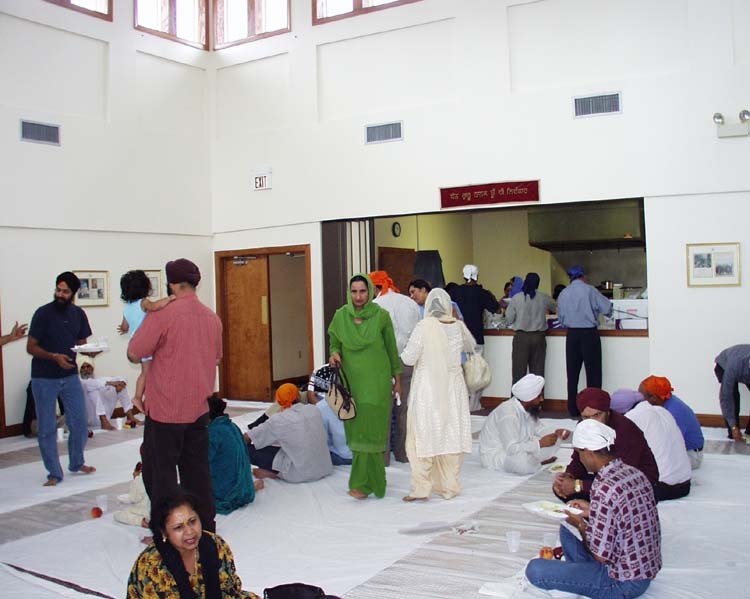 At the conclusion of the service, after the distribution of the prasad (a “pudding” made of wheat, sugar and butter), worship hall and kitchen become one as members of the congregation push back the left wall, roll up the Oriental runner and roll out long strips of plastic in preparation for serving the langar, or community meal. The plastic strips are placed parallel to the altar rather than perpendicular to it (as the Oriental rug runner is placed), and the community members gather on either side of these plastic strips, forming impromptu “tables” on the ground. Dr. Guram said this humble means of eating emphasized the Sikhs’ rejection of caste–no matter what a person’s social status in the outside world, in the gurdwara, he or she will sit on the floor to eat just like everyone else. Members of the gurdwara have been involved in Partners in Dialogue, a local interfaith organization. Dr. Guram said he has been more involved than most people, simply because he is retired and has more time to participate than some of the younger members of the gurdwara, who keep busy schedules. 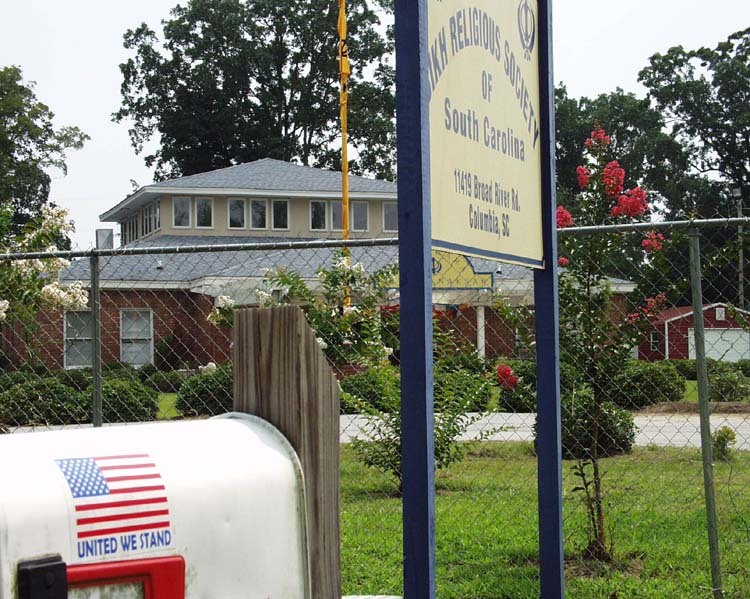 Dr. Guram said the Columbia gurdwara has not experienced any problems from the greater Columbia community, either in the acquiring of the land to build the gurdwara or in the social situations following Sept. 11, 2001. He said that the confusion of Sikhs with Muslims because of the Sikhs’ turbans did hurt American Sikhs in general (he mentioned the deaths in Arizona), but he said they had not seen anything like that kind of violence in Columbia, S.C. Several other members of the gurdwara did mention having some difficulties with the larger community, stemming mainly from ignorance about their religion and a lack of appreciation for the traditional dress (turban, etc. ), but on the whole they also confirmed that relations with the larger community were good in Columbia.